Yours Truly: You are so awesome! I can't believe December AND 2016 is almost over! I hope everything is not too hectic and that you've been able to enjoy all the wonderful things about this season. I'm forging ahead and making some thank you cards with the ODBD December release for the "Let's Get Sentimental" Shining the Light Challenge. It was a very quick card using scraps from the Blushing Rose Paper collection and some twine. 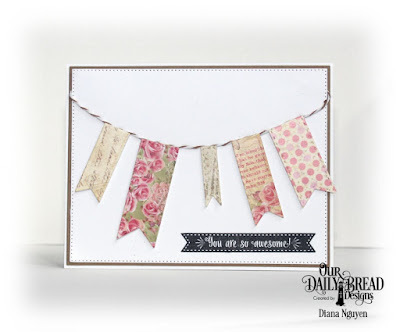 I do hope you'll find some time to make a little mess and play along with this month's "Let's Be Sentimental" Shining the Light Challenge by Our Daily Bread Designs. And if you'd like more inspiration, please check out by my talented Challenge Team sisters Chris, Julie, and Robin. Remember that you have until December 30th to link to the ODBD blog.